Jessica Jeyabalan, BSBA ’16, had no intention of pursuing a business degree when she set foot on campus freshman year. Four years later, she is graduating from Kogod School of Business and accepting a full-time job offer from her current internship at JP Morgan. Like many students, Jeybalan’s undergraduate journey changed direction. She knew she wanted to attend school in a city for the opportunities, but it was not until sophomore year that Jeyabalan decided to alter her academic path. Check out the rest of Jessica Jeyabalan’s interview. Kogod School of Business: Which Kogod class or classes influenced your career goals? 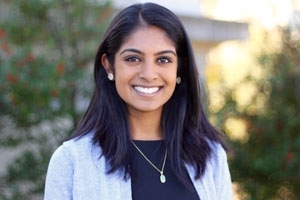 Jessica Jeyabalan: I'm interested in the intersection of Finance and Technology. A couple classes I've taken that have helped me figure out what I enjoy were Digital Leadership and Strategy, and Real Estate Principles and Transactions. KSB: Which Kogod professor or professors impacted you the most? Why? JJ: Professor Evans was my accounting teacher my sophomore year. She was so invested in the success of her students, which pushed me to do better. KSB: What internships have you had? JJ: I've been a Legal Intern for Teaching Strategies, LLC; Finance/Accounting Intern for the United Nations Foundation; Marketing Intern for Plum Consignment; Investment Intern for FRB Realty Capital; and a Global Wealth Management Intern for JP Morgan, which led to a full-time offer with the firm post-graduation. KSB: What is your favorite Kogod memory? JJ: I have loved being a peer consultant my senior year. It's rewarding to help students figure out their career aspirations and work with them on their resumes and cover letters. KSB: What is the most helpful part of visiting a professor’s office hours? JJ: Learning about different industries from them. Many professors have had experience in the field, so it’s very interesting to get their viewpoints on different subjects. KSB: How are you planning to incorporate your passions into your career? JJ: I am passionate about promoting women in the workplace and potentially pursuing real estate development. I hope to get involved in these areas when I start working. KSB: As a woman, have you felt supported by other women/minorities on campus? JJ: Yes. I have been fortunate enough to be a part of Delta Gamma, a sorority on campus that focuses on empowering one another. Through this organization, I have gotten internships, help in my classes, and answers to career questions. I was lucky enough to be the President last year. I would not be the person I am today without the support of these women.